Beautiful dusky purple colour making it perfect for any season. Perfect condition.High neck and cuffed short sleeves. Model is 5ft2 and UK size 6. But be 100% satisfied that the product is as you see it and will be happy! Asos Sample Mulberry Legging Style Pyjama Bottoms size 10. Cotton Stretch Jersey. Sample label attached. Asos Cotton Blend Jersey Loungewear Bottoms Size 10. Ombre purple. ASOS petite linen mix t-shirt. Lightweight and fabric has a slight stretch. UK size 8. Would comfortably fit a size 10-small 12. ASOS Dress in abstract print Size 10. I bought this two years ago never wore it apart from trying it on had beautiful jersey stretch and a silky finishing giving you that bodycon fit. When I tried it on it went to my knees and I was between a large 10 and regular 12. I don’t wear dresses that are just above my knees anymore hence why I’m selling this one. Womens ASOS Dreams Purple Pyjama Set with White Hearts - UK Size M Condition is Used. Dispatched with Royal Mail 2nd Class. Oversized see- through knitted jumper. Used but still in good condition with no holes or stains. Great for everyday casual look. Slightly shorter at the front and longer at the back . For a relaxed casual outfit. Size 10 but will match bigger size also due to the oversized shape. Slightly distressed. Satin look party dress in purple. One shoulder design with large bow detail. Ruched detail down one side. Length 30". BNWT ASOS Bodycon Skirt with Split. See Pictures For Details. 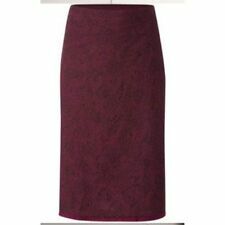 ASOS Size 12 pencil skirt in purple jersey rib material. Elastic waist band, never worn! ASOS Lilac Top With Exaggerated Sleeve. Dispatched with Royal Mail 2nd Class. ASOS dress in paisley velvet with sheer black insert panels at the front and at the sides. Lined, with a light underskirt to hold up the shape of the full skirt. Material does not have stretch. Concealed zip down the back. Lovely ASOS dress in a size 6. Gorgeous and delicate light pink colour. Features ruffle overlay bandeau detail and peplum hem to give you the perfect hourglass silhouette. Only worn once in perfect condition. Offers and questions welcome. ASOS 100% cotton longer cardigan, size 8, 36, bust 31" vgc wine. wine mix colour weave. button front, v neck. Spare button attached to label. Length 27.5". Front pocket. A Lovely Striking funky design. ASOS PETITE. Multi Coloured. Cap Sleeved. Party Dress. Cut Out Back. Unique and Trendy Bendy Hem Skirt, perfect for a party occasion. The dress has a cut out back with a back zip. Length from the top of shoulder to hem 36”. Asos Jersey Midi Dress. Size 8 With Back Detail. Black. Dispatched with Royal Mail 1st Class. Lovely ladies purple sleeveless cropped vest top by Asos size 10. Worn and is in good clean condition. All items purchased that are used or brand new without tags will be washed and ironed before dispatch. All items purchased must be paid for within 48 hrs please or contact me stating that you need more time. thank you. Feel free to browse through my other items that I have for sale, grab yourself a bargain. If you purchase multiple items I will combine postage charge for you. Fully lined, with underskirt layer having a 2 tier black netting trim. Lovely, good quality black lace flared skirt, with purple pink underlayer giving a great contrast through the black. Gothic BLACK & Purple Lace netted Flared SKIRT. Red block top sweater. Purple long sleeves & rib around neck. Brown bottom part. Asos top.size 6.purple.sleeveless with open side. 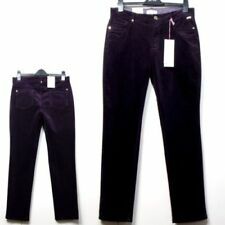 Trouser is M. Only worn once. Elastic Waistband with stretch fabric. Cotton, Elastane Blend. Length: 38cm. Hoodies & Sweats. Pattern: Striped. Denim Waistcoats. 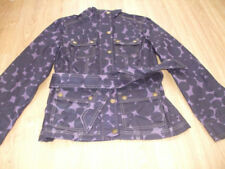 Denim Jackets. Main Material: Cotton Blend. Size Guides. Main Colour: Purple. Chest Size: L.
100% Cotton. Close-cut bodycon fit. ASOS Violet Tea Dress with Jewelled Bust. Cotton jersey. Approx bust 23". Approx length 24".